Do you work at or manage a property where contractors and visitors need to be tracked and recorded? Do you keep IDs at the desk for security? If you answered yes to either of those questions (or even maybe if you didn't, but you'd like to start improving building security), you may be interested to learn about our license scanner. 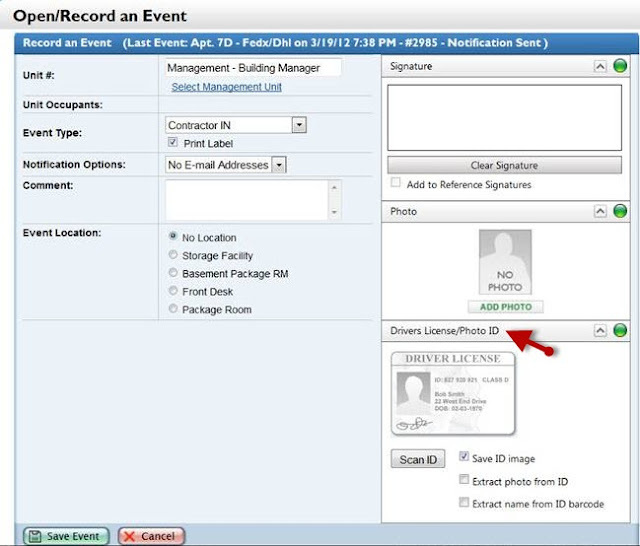 With the scanner, you can capture visitor/contractor IDs and save them in the Event Log, every time you log someone in to the building. You can then go back and search to see who was in the building; each person's ID will be stored with his/her individual record. With some state licenses, you can even extract the name right from the ID, and pull it into the "comment" field to make the logging-in process easier. Be sure to check out our other great equipment; you can also go directly to our online order form.